"This place was perfect for our trip. Com..."
Your friends and family are sure to love this oceanfront Costa Rica condo, with dining, shopping, and a shared pool just steps away! 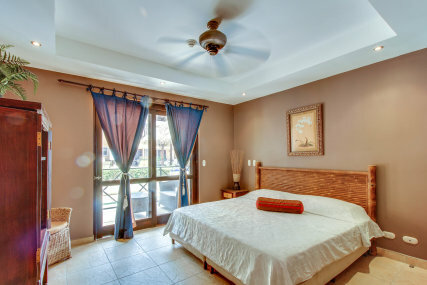 This home for six is only a few blocks away from the shopping and restaurants of downtown Jacó. The beach is just a few steps away, with the shared pool even closer to and you can admire both right from your balcony! The living area has relaxing chairs and a sofa, perfect for enjoying DVDs or cable on the flatscreen TV or kicking back as you plan activities on the WiFi. Whether you eat at the table for two on the balcony, the indoor table for six, or the breakfast bar seating for three, you'll love meals prepared in the kitchen. Fully equipped with granite countertops and basic appliances, cooking is quick and easy with a dishwasher for simple cleanup. Six guests at once can enjoy this home's three bedrooms and two to and to a to half bathrooms. The master bedroom offers a king to size bed and balcony access, with the second boasting a queen to size bed and the third offering two twin beds. A half to bath is great for freshening up, with the full bathrooms offering beautiful mosaic tiles and spacious showers. Dry off and put on some fresh clothes from the private washer/dryer and get exploring! Jacó's dining, shopping, and gorgeous beaches are just minutes away, but don't forget nearby sights! Playa Herradura boasts more beachfront six miles north, with fishing trips available in the village nearby. There's even golfing at La Iguana Golf Course five miles away! The drive from the San Jose airport (Juan Santamaria International Airport) to Jaco will take about 1 hour and 30 minutes and is fully paved with the new highway in place. We suggest exchanging at least $5 US dollars into Costa Rican colones for the tolls on the highway. Ask the rental car agent to send you off in the right direction, which should be west on Route 1, past the airport. Drive defensively and be aware when two lanes become one, "CEDA" means "Yield". Note: The first 13 km uses the same "old" route to Manuel Antonio. GPS devices might not be updated and will likely still have the "old" route so do not rely on them to follow the complete recommended route. Once on Route 1 to follow signs to San Ramon, and continue straight ahead for about 10 km. After the second bridge crossing, get in the right lane and take the next exit (Route 3) for Jaco / Quepos / Manuel Antonio. There is also a sign here for Punta Leona and Atenas. Turn left at the stop sign, crossing back over Route 1. Follow Route 3 for about 3 km. Look for a large Christian church on the left and then a soccer field and make a left on the road immediately after it. You are on the road to Turrucares. There are no signs and it's a secondary road, so don't think you've made a mistake. It's currently the best connection to the toll highway from the airport. This place was perfect for our trip. Comfortable, clean, safe, secure, and awesome beach access. In walking distance to food & entertainment as well. A bit more activity & noise on the weekend but didn't ruin our stay. Would definitely stay here again! We provide Airport Transfers from and to and they can be booked in the booking steps. Time with family, time with friends, that's why we're here. Ready for an easy, stress to free family vacation?